On Saturday, April 30, the Ford School honored the accomplishments of 174 new graduates, including 7 doctors of philosophy, 96 masters of public policy, 7 masters of public administration, and 64 bachelors of public policy. Faculty remarks were delivered by Yazier Henry. Alexis Farmer (BA ’16) and Grace Evans (MPP ’16) delivered remarks on behalf of the graduating classes. And Ford School alumnus Hardy Vieux (MPP/JD '97), legal director for Human Rights First, delivered the keynote address. Enjoy this Commencement 2016 Storify. 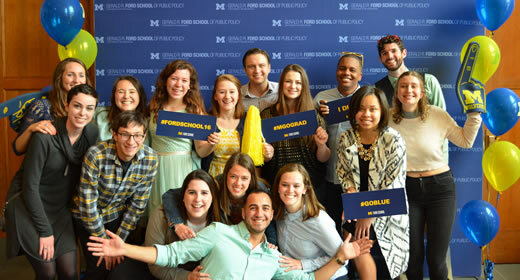 From ice cream and sprinkles at the Fordie Grad Fair to @fordschool swag, photo booth drama, proud parents, and best wishes from alumni—we've included a curated series of quotes, tweets, videos, photos, and photo albums celebrating Commencement 2016.